I bought a road bike five years ago after I ruptured my ACL skiing. It was only intended as a tool for recovery, but quickly became an obsession and a lifestyle. Living in the Swiss Alps, I loved using my bike to explore places I had never been before. Inspired by local rider, Alain Rumpf’s adventures on TCR3 in 2015, I strapped some luggage onto my bike and rode to Barcelona that autumn. Bikepacking trips became a new obsession for me and I try to fit in a few each year. Riding bicycles was part of my life since I was a child. For my eighth birthday my parents got me a really nice MTB and I started to explore the mountains surrounding my hometown. After I moved to Bremen in 2010 to study geography I started working as a bike messenger. This was the point the serious bike riding began. I took part in usual road bike races and some bike messenger championships. I also helped organising and participated in Alleycats. In 2013 I did my first long distance bike ride with a friend of mine. We went from Bremen to Croatia in 10 days, it was an incredible experience. Since then, I did multiple few-day-rides to other cities. In 2013 when the first TCR started, I followed the race with great interest and I realized my adventure to Croatia was a joke compared to the performance of the participants of the TCR. Ever since, I was dreaming to take part in the TCR. But it took some time to feel ready. I don´t have that much experience in endurance bike rides and sometimes I wonder if I will ever feel ready for this adventure but I´m really looking forward to the 29th July. I will try to make it to the finisher party! "Thirty years ago, when I was 19, I attempeted to cycle from manchester in the UK to Athens in Greece. When I got to Austria, the traffic on the alpine passes un-nerved me so much I decided not to go on. Ever since then i've regretted not finishing my ride. Then last year my cycling buddy told be about a race across europe that his brother-in-law Ben Delany was taking part in. So that summer I followed the TCR riders on social media, I watched their "dots" as they crossed Europe and began to wonder if i could have a go at this monster of a race. So here I am. This is the first race of any kind i've entered. I'm feeling totally out of my depth, but also eager to give everything i have to this mad celebration of cycling." Dermot is a British/Irish cyclist. At the age of 40 he moved from the UK to County Wexford in the south east corner of rural Ireland where he now lives with his family. Soon after the move he quit smoking for good and that's when he took up road cycling. Dermot makes his living designing sewing patterns. I moved from Italy to Mallorca with my family 5 years ago, where I opened a bike bar in Artá, called "La Bicicletta"... guess why?!? Following a hip prothesys operation due to a motorbike crash in 2007, I lost 30kg and became 6 times an Ironman Finisher. In 2015 another crash, another prothesys (shoulder). Swimming became painful...so I could only cycling, and with cycling I mean Ultra cycling! I did second place in Tourtour Mallorca 2016. Something inside me has changed lately... I wanted to ride hours and hours, did not want to stop for days and days. Joining this emotion together with wonderful landscapes, became the perfect cocktail to me. 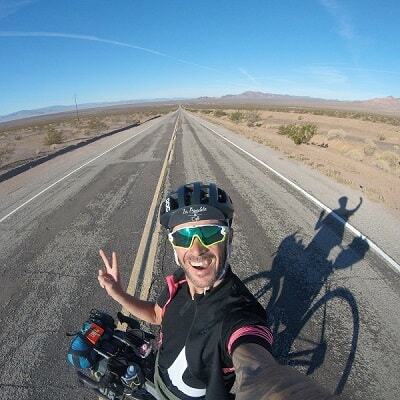 Last year I wanted to put myself on a challenge, crossing USA alone self supported. I was riding and riding and riding, stopping only when it was necessary. It was a special experience, because I realized that my limits were only in my brain. I finished my travel in 13 days. To me Transcontinental has always been a dream, something to be afraid of, but the stories and videos I saw made me more and more obsessed with it, I was inspired. I began to think into myself that you will never know if you can make it, until you try it! Everything will come from this experience, will be pure joy, with positive or negative ending... it will always be a crazy experience to share with my family. I don't consider myself a superhero, I don't really have the perfect athlete body, but I have 4 powerful motors behind me: my wife Stefy, my kids Alessio and Asia, and my historical coach Marco Morando. Keen Cyclist and graduated in Anthropology, Francois always used to ride a bike as a young boy in his homecountry, the Belgian Ardennes, or as a commuter in the city. He became passionate about cycling four years ago when he took, by chance, a bike messenger job in Brussels. That short experience was enough to transmit him the virus of cycling. As he travelled right after to Africa, François bought his first road bike and got interested in everything related to cycling. 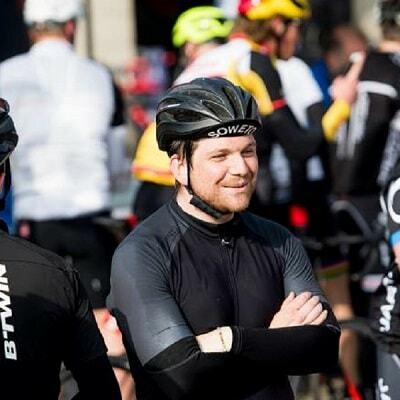 When back in Belgium, he registered to his local club where he does weekly group ride, in addition of his solo rides. In Brussels, he met randonneurs that inspire him to ride long and bike messengers introduced him to the TCR since the race departs from Grammont (French for G'bergen), only 35km from Brussels. Watching stories about Mike Hall, and following the Transcontinental with its breath-taking sceneries gave him itchy feet. For TCRNo5, he had the chance to work as volunteer at the start. In early 2018, he received an email to apply for TCRNo6. He just went for it! A love story does not come alone. More or less at the same time he had fell in love with cycling, he also found love during his travel and is now a happy husband of a Zulu princess. Franks Simons, rider number 172 on TCRNo5 died on the 29th July 2017 only a few hours into the start of his race. To honour the memory of our fallen comrade we have kept his cap number for him and for his family. We will be remembering Frank, along with other members of our community lost on the road over the past years, at the start on 29th July 2018. We are so sad we did not get the opportunity to know Frank better. As we approach the start of the sixth Transcontinental Race on July 29th we take a moment to commemorate a man who was strongly dedicated to the sport of long distance cycling. His name was Frank Simons, at 71 one of the veterans of this cycling community. Physically and mentally in great shape. A man with a strong mindset, focus and good navigational skills and above all, a sportsman with a great sense of adventure. Always searching for the extremes; short races were not enough of a challenge for Frank so he’d cycle an additional distance before and after the races he signed up for, turning them into a proper workout! Audax rides also played an important role in his training schedule. He seldom missed training at his local cycling club; they were not to be missed, especially the day after a race. When warmed up, Frank would soon be riding at the front doing work to pull the train. This mentality was normal to Frank, something he enjoyed very much, building his strength and capabilities for events like Paris-Brest-Paris, Miglia Italia, Merselo-Verona and a solo journey of 2800 km to Santiago de Compostela. Every year he extended his boundaries. In January 2017 he decided to sign up for TCRNo5, a 4000 km race from Belgium to Greece. A great challenge for Frank. On July 28th 2017 Frank was fully prepared to start, what was tragically to turn out to be, his last great adventure. Leaving behind the beautiful and atmospheric town of Geraardsbergen, with around 300 of his fellow riders, Frank set off into the dusk on his 4000 km journey to Greece. Overwhelmed and empowered by the amazingly supportive crowd, the riders were surrounded by a sea of flickering torches in their ascension up the ‘Muur’ before vanishing into the heat of the night, following their individual journey towards Meteora. In this special setting Frank’s final hours were at hand. On July 29th at three o’clock in the morning, doing what he liked most, Frank Simons perished in the saddle. A sudden and dramatic event had occurred, which ended this great adventure. Dear Frank, in the hearts of many of us you are remembered as a dear husband, father, foster father, grandfather, uncle, mentor, friend and last but not least as a great rider. Mi piace viaggiare in bici. Giri in bici : 1001 miglia - giro delle Repubbliche Marinare - Pinerolo Barcellona Pinerolo - Savona Reggio Calabria Savona ( andata costa ritorno appennini ). Gare in bici : campionato italiano ultracycling. I am a dentist doctor. In 2004 I completed the Prestige, then in 2007 the transition to the Randonnée (long distance races) and the patents to enter the Italian National Randonneurs, which I have been part of since 2007. In 2009 Sorrento -Tropea-Sorrento of 1000 km. 2011 Paris Brest Paris. 2012 1001 miles. 2013 London Edinburgh. London. Randolomitics and Superandonnée Prealpina in 2016. The tour of the 4 Nations of 1200 km and the North Cape 4000 (4200 Km)in 2017. This year finisher at the Race Across Italy. My name is Gianluca Morini, also known as Gian or Gionny, depending on my friends’ moods. I’m 44 years old and I’ve had a rather adventurous life, but hey, we’re here to talk about cycling! I’ve owned a road bike since I was 12 years old. I never had a motorbike or a scooter in my teenage years. I’ve always been a cyclist. My life has been marked by intense passions which some of my friends and family would call obsessions. Cycling is certainly one of them and I got back into it three years ago, after many years spent working at sea. Currently I cycle 10,000 kilometers a year. I ride with the Byron Bay Cycle Club, I race my bike for fun, seeking some Sunday morning glory. Participating in the Transcontinental race is simply a dream coming true. While racing the TCR I will wear the colours of Nazra Syria, a charity which has been active since 2012 and provides local solutions to families in Syria in order to improve their daily lives and help them find a better future. You can check out at www.nazra-syria.org/en who they are and what projects they are currently fundraising for. They are notably supporting a number of Syrian families, providing them with clever solutions such as rocket stoves and solar cookers, to cover the basic needs in a war torn country, showing how ingenuity can save lives. As per my day job, I work for Greenpeace International. I’ve been a cyclist since my teens, riding and racing both road and mountain bike on and off. As I grown older I more enjoy the ride itself, especially on new locations. Over the last years, I've been more and more intrigued by going from A to B and then to C.. I got my eyes on TCR in 2016, applied for 2017, but got a spot this year. I really look forward to the ride, taking in Europe from the saddle, finding out whats right behind the next bend. I work with IT-security, happily married and father of two. I have been riding many mountain bike races all over Europe for many years.